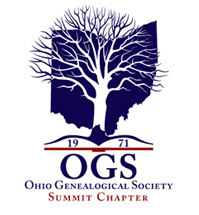 Ancestor (or pedigree) charts have been submitted by the members of the Summit County Chapter of OGS. First: Click on the alphabetical list below access the index containing your surname. You can search or scroll down for the surname you are researching. There is a number with each surname which corresponds to the chart on which the surname is found. Next: Go to the submitters list to learn the name and address of the person who submitted the chart you are interested in or you can find the actual chart at the Akron-Summit County Public Library, 60 S. High Street, Akron, OH.